Here's a guest post by Gina Abudi, who I've had the pleasure of meeting a couple times here in New England. Gina's also hosting a guest post from me over at her blog. Given the number of baby boomers expected to retire between now and 2030 (the last group of baby boomers reach of the age of 65 in 2030, and, of course, some may choose to work past age 65) organizations need to prepare others to take over leadership roles. Some organizations will likely source externally to fulfill leadership roles within the organization; however, many other organizations realize that it may be better to move individuals into these roles who already understand the business and have already been working in the organization. And, certainly, a combination may occur where organizations promote from within and look to fill some roles from external. These organizations who are interested in recruiting from within will look to identify “high potentials” already working within the organization in a variety of roles. High potentials are often identified as those individuals who have the potential to grow into leadership roles within the organization. They are hard working individuals who have the potential to be leaders based on their knowledge, skills, and the behaviors and attitudes they display. They are high achievers within the organization – willing to do what is necessary to get the job done. They are eager to learn new skills and take on additional responsibilities and bigger challenges. I’m sure you can name many more than just what’s on this list. This is certainly not an exhaustive list. Think of the leaders you know who are great at what they do. What skills and behaviors do they have? What makes them good at their job? Why do you, or would you, follow them? Please provide your thoughts in the Comments field below. Organizations may choose to look at their best leaders and use those competencies they have identified in those specific individuals to determine what they expect/need from their high potential employees in order to develop a leadership training program that meets their professional and personal needs and helps the company meet its long term objectives, which includes having individuals in place and ready to take on senior leadership roles within the organization. An assessment should be done of the high potential employees to determine their current strengths and development needs. Any skills that are not needed or used now by the senior leadership team, but may be used at a later time, should be considered when developing the leadership training program. For an example, let’s assume that the organization is currently doing business throughout the United States; however, the Board of Directors would like to see the organization grow and do business internationally. Your upcoming leaders will need to understand how to do business internationally – international laws and regulations for doing business in various countries, cultural differences, the ability to gauge the market overseas including identifying market for product or services and the competition, developing overseas offices, leading virtually, etc. These additional needed skills and abilities should be part of any effective training program for the high potentials and should be part of any assessment to determine if an individual has the potential to be a senior leader within the organization given these future needs. 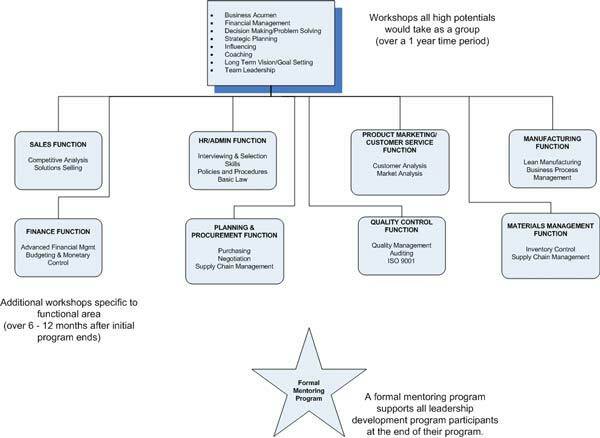 Let’s look at a case study of a manufacturing company that saw the need for a leadership development program for their high potential employees. We’ll look at how they determined what competencies were needed for future leaders and what comprised the program that was developed. We’ll also look at how additional individuals were selected to attend the program. In a future post, we will look at how the results of the program were measured. XYZ Widget Manufacturing Corporation has been in business since the early 1980′s manufacturing widgets for both business-to-business and business-to-consumer sales. The following functional areas exist within XYZ Widget: Finance, HR/Admin, Sales, Customer Service, Planning & Procurement, Materials Management, Manufacturing, and Quality Control. Of those 8 functional areas, 5 of them are led by senior executives who are in their 60s and expected to retire within the next 3 – 5 years. The other 3 are led by senior executives in their mid-50s. There is no planned retirement date for them, but the Board of Directors for XYZ Widget wants to be prepared. To that end, the Board of Directors has asked the company to start thinking about succession planning. How will they fill the leadership roles at each of the functional areas? The learning and development group at XYZ Widget interviewed each of the current members of the leadership time (across all functions) to determine what skills they believed were required to be effective in their roles. These interviews were done in person, one-on-one. The group also met with the Board of Directors to understand their vision for the company and their expectations of the next group of leaders. This meeting was done with all of the Board of Directors in small groups. Additionally, they surveyed, on-line and anonymously, other individuals in management roles to get their perspective on the strengths and weaknesses of the current leadership team and what they believed were needed for future leaders given the direction the company was heading. All interviews were confidential. The data gathered was used to determine what competencies (skills and behaviors) were required for future leaders. Additionally, external research was gathered/conducted about a variety of companies in the same and similar industries to determine what were generally considered as key skills and knowledge for executives. The learning and development group also interviewed in depth each of the individuals initially identified as high potentials in the company. They also interviewed the co-workers of the high potentials (anonymously via an online survey), their direct managers, and members of the senior leadership team to get their perspective of the strengths and weaknesses of these individuals. They gathered data from performance reviews, past projects they worked on, and looked at the roles and responsibilities they had within the organization. They also reviewed in detail areas where the high potentials took the initiative to make improvements and/or get things accomplished – in other words, opportunities they found to take a leadership role. Let me step back a moment, these individuals who had been identified as high potentials had worked for the organization for a minimum of 8 years and some as long as 15 years. There were individuals who had developed an understanding of the workings of the company as a whole. They were those individuals you would find pitching in to help out regardless of the project in order to ensure the company reached its goals. They were all strong problem solvers and were driven individuals. And, they were passionate learners – learning all they can – frequently on their own – to understand the company. Prior to the start of the program, preparation work was required. This included what the individual expected to achieve from the program (their goals and objectives), how they intended to use their new skills and knowledge and some required reading. Throughout the program, and in between sessions, participants were assigned projects to lead and had to complete required readings. Additionally, they were required to put together strategic plans as to how the specific functional area they were assigned to might develop and grow in the future. Assessments were done throughout the two year program to gauge increases in skills and knowledge. All graduates of the program were assigned mentors from their specific functional area. These mentors were executives in those areas and had agreed to participate in a formal mentoring program to groom junior high potential employees to take on executives roles in the future. Mentoring was a required component of the executive’s role and formal mentoring plans were submitted to learning and development and monitored regularly for progress. A total of 30 individuals went through the initial pilot program – 20 considered high potentials and 10 others who were selected from nominations (of 35 total nominated). Two programs were run simultaneously – with 15 participants per program. The program ended up taking almost 3 years to complete due to scheduling issues (trying to get everyone together was more difficult than expected!). 25 of the 30 participants completed the program in its entirety, some of those were assigned mentors during the program (rather than at the end as planned) to provide them additional support in getting through the program. The company determined that some of the individuals who were not considered part of the high potential group but rather were nominated and selected might actually be a better fit for an executive leadership role over the previously identified high potential employee. Of the 5 who did not complete the program, 1 of them quit for other jobs, and 2 of them dropped out of their own volition as they decided that the workload was more than they wanted to commit to at this point. The other 2 were released from the program because they did not complete required assignments and had very limited participation. Gina Abudi is President of Abudi Consulting Group, LLC. She provides clients of all sizes strategic direction and implementation of programs and strategies around projects, process, people and technology. Gina was honored as one of the Power 50 from PMI® - one of the 50 most influential executives in project management, working to move the profession forward and has served on PMI®’s Global Corporate Council as Chair of the Leadership Team. 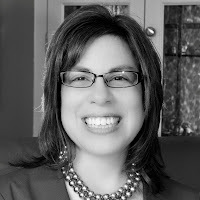 She is currently President of the PMI® Mass Bay Chapter Board of Directors (2011 – 2013). Gina presents frequently at conferences, industry events, and corporate events on a variety of leadership, project and process-focused topics. Gina received her MBA from Simmons Graduate School of Management. She served on the Simmons Graduate School of Management Alumnae Association Board from 2007 – 2009. Gina can be reached via her website: http://www.ginaabudi.com/. What a great and comprehensive Case Study! I find measuring who has the skill set to be a great leader can be a difficult task. As a leader, how you communicate determines whether or not others perceive you as credible, knowledgeable and trustworthy. Without doing this effectively you inhibit your maximum potential to influence, build long term relationships and increase profits. Thanks, I agree, Gina did a did job documenting this.